This is the third galette recipe on my website so you can guess that I can kind of love them. They feel much easier to assemble than a pie but I always get so much satisfaction with the amount of pastry you get in each slice. This is my ode to apple pie which I think is such a comforting thing to eat when the weather is chilly outside. Apple pie has always seemed like a wintery dessert (although let’s be honest, I’d eat it any time of the year!) The filling in this recipe can be made the day before and refrigerated till needed and if you have leftover crumble, you can freeze it to use another time. 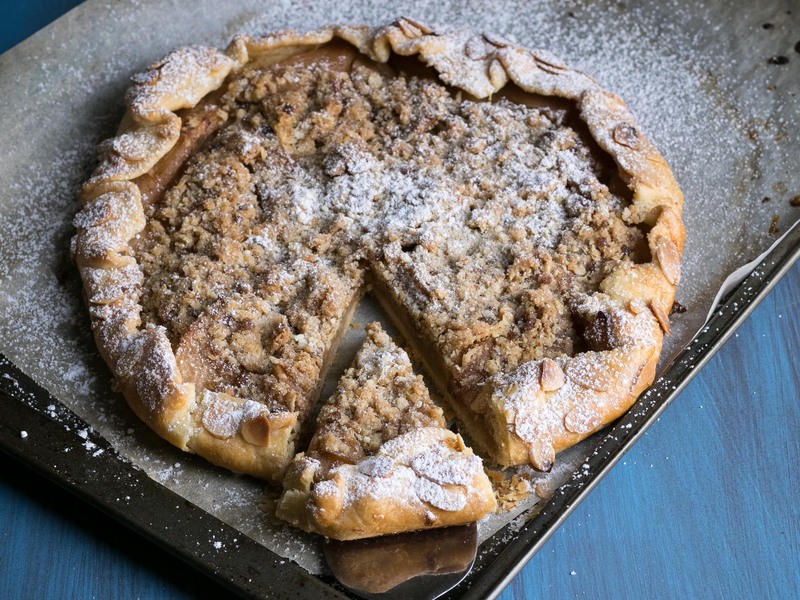 Serve the galette warm with some cream or ice cream and all your apple pie cravings will be satisfied. To make pastry, pour the flour and butter into a food processor fitted with a regular or dough blade. Process until the mixture forms coarse crumbs. Add 2 tablespoons of cold water and pulse until dough just comes together in a ball. If it seems too dry, add one tablespoon of water at a time and pulse to see if the dough comes together. Lay out a piece of plastic wrap. Tip the dough onto it and pat out to roughly form a flat squarish disc. Cover dough tightly with the plastic wrap and place in the fridge to rest for at least 30 minutes. To make the filling, melt the butter in a small saucepan and add the sugars. Let it simmer till the mixture is just starting to bubble and add the apple slices. Cook the apples for approximately 8 minutes or till they’re just tender. Set aside to cool. To make the crumble, add the dry ingredients in a food processor and scatter the butter pieces over the top. Pulse everything together till just combined and the mixture looks like coarse breadcrumbs. When you’re ready to assemble the galette. Preheat the oven to 200 degrees Celsius. To prepare the galette, remove the dough from the fridge, unwrap it and place it on a lightly floured surface. Roll the dough out roughly into a large round circle. It’s a galette so it’s meant to be rustic so don’t stress if it’s not perfect, just try to keep the dough thickness around 3-4mm. Lay the dough on a baking try lined with non-stick baking paper. Lay the apple slices on the dough in whatever pattern you desire but leave approximately a 4cm border all around. Fold the edges of the pastry over the apple slices, pleating the edges as you go. Scatter the crumble all over the apple slices. Brush the edge of the galette with egg wash and scatter the almond flakes around the border. Bake the galette for 35 minutes or until the pastry is golden. I like to turn the baking tray half way through. When the galette has finished baking, remove it from the oven and allow to cool on a baking rack. Dust the galette with icing sugar and serve warm.